Malibu Creek and Dominguez Channel Watersheds: Capacity Evaluation of Soft-Bottom Reaches (CA) | WEST Consultants, Inc.
WEST Consultants conducted a hydraulic modeling and channel capacity study on very short notice for the Los Angeles County Flood Control District (LACFCD). The study was a requirement for LACFCD to meet Waste Discharge Requirements of the Los Angeles Regional Water Quality Control Board. The study included cross section surveys for ten soft-bottomed flood control channel reaches within the Malibu Creek and Dominguez Channel Watersheds. 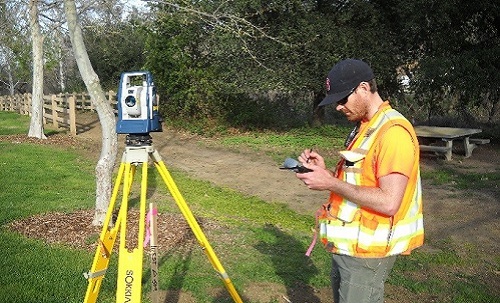 Total station surveys were performed to verify channel geometries and structures. Survey notes and photographs of all reaches were collected documenting obstructions and channel vegetation for inclusion in hydraulic model analysis. Due to LACFCD’s short timeline, field survey data were transmitted daily to the WEST San Diego office for use in assembling hydraulic models while crews were working on the next reach in the field. Initially, hydraulic models of existing conditions were developed. A model of existing conditions included design flow rates and existing vegetation levels in the channel reach. For reaches with insufficient capacity at existing vegetation levels, additional analysis was conducted to determine if the reach might have excess capacity for a “design condition” (or estimated design condition, usually with less vegetation than existing) scenario. If the model results showed excess capacity under the design condition scenario, further analysis was completed with added native vegetation in a quantity that would still maintain the design channel capacity. The type and species of the additional vegetation was determined by the LACFCD biological consultant. The field survey of ten soft-bottom reaches and the initial existing conditions models for all reaches were completed in just five weeks. Initial results included existing condition HEC-RAS hydraulic models and a summary table of freeboard results.